Obviously, British politics is incredibly unpredictable right now. Nobody knows what is happening this month, let alone the future. We don’t know when the next general election will be or, in the wake of The Independent Group, even which parties will be competitive. 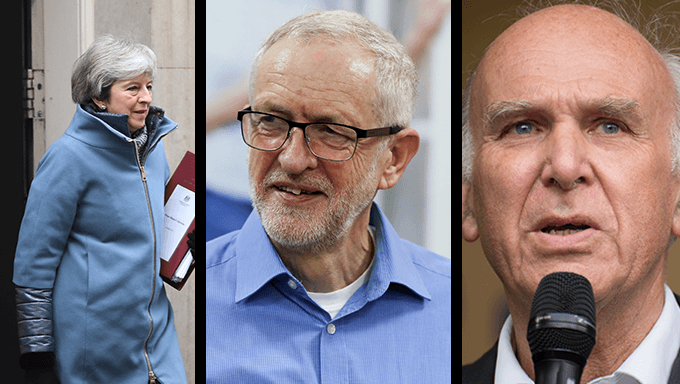 If, as scheduled, there is no election until 2022, it is safe to presume that at least two of the main party leaders will no longer be there - Theresa May and Vince Cable have already committed to standing down. Much to his detractors’ frustration, Jeremy Corbyn has made no such pledge but the Labour leader is having a very rough time. As Brexit unfolds, don’t be surprised if the leaders are swept away. The top political betting sites have started to list markets - Ladbrokes offering 6/1 that all three are gone by the end of 2019. I reckon that represents decent value and will appear so at some point later this year, perhaps enabling an easy cover bet. When Cable pledged to stand down after Brexit is completed or stopped, most thought that would now be imminent. Perhaps it is but, if Brexit drags on for years, the Lib Dems won’t become viable under his leadership. He has been invisible in media coverage and now the relentlessly newsworthy TIG have camped on the party’s centrist lawn. Cable has already mooted a new electoral alliance. Any such move could be problematic with their members, who were already weighing plans to give non-members a chance to vote in party elections or even take leadership roles. Expect this to be resolved one way or another this summer. Whatever happens, the status quo won’t survive. They will switch to a much younger leader - Layla Moran is my pick at 15/8 with Paddy Power. May has, of course, been on the verge of losing her job for nearly two years. Coral offer 8/13 to leave in 2019, despite being safe from a Tory leadership challenge until late December. The assumption built into those odds is that she will go very soon after Brexit is completed. Nobody wants her to lead the wider future trade negotiations with the EU - the role for which her rivals have been waiting and positioning for. In the meantime, every day presents more peril. In the weeks ahead, May must either pass a deal that is deeply unpopular with her party, deliver a no deal Brexit, or delay it. None are desirable and the latter would surely be the final straw. It is at these crisis moments that a politician needs allies. It is hard to see who May has left. In two years, she has lost more Cabinet ministers than the Major, Brown and Cameron governments combined. Unless passing her deal and suddenly transforming public opinion about the deed, it is hard to see what purpose she would serve to the party much longer after June. The hard leg of our treble is Corbyn. The Labour leader is 7/4 with William Hill to go this year and that price isn’t especially appealing. It may seem amid all the negative coverage, splits and diabolical poll ratings that he is on borrowed time but his party doesn’t generally work that way. Labour members are pretty loyal to their leaders. When Gordon Brown looked an election loser in the run-up to 2010, rivals swerved a challenge because they expected the members to back him. When Owen Smith challenged Corbyn in 2016, he was thrashed. Now, that doesn’t mean he is invincible with the membership. Smith was virtually unknown and ran an awful campaign, yet still got a respectable 38%. Who can say how a party heavyweight, laying out a clear, alternative direction for the party, would have fared then? Let alone now, under different conditions. It isn’t clear that Labour’s membership is quite as enormous or active as then, nor Corbyn as popular. His lack of leadership over Brexit has particularly alienated many a natural supporter. Meanwhile the polling remains crystal clear - Corbyn is a drag on the party. Recent surveys including TIG implied that, by changing leader, Labour would turn electoral defeat into victory. However it is hard to see internal opponents directly challenging him, having bottled it previously. The TIG defectors preferred to walk away and that deepened the wedge between MPs and grassroots. Any move would be seen as a challenge to his socialist agenda and grassroots movement. While Tom Watson is prepared to use his own mandate as deputy leader to challenge Corbyn on policy, I don’t envisage a divisive challenge. If Labour are to change leader before the next election, it will probably be because he has been persuaded to step aside. Plausible but there is no indication. One way Corbyn could be removed quickly is defeat after a general election and that is highly possible within our 2019 timeframe. If May doesn’t call one imminently to resolve Brexit, as some reports have suggested, there is every chance her replacement does so later in the year. Like her in 2017, they would see a rare opportunity to destroy Labour, especially if TIG are around and competitive. I’m not convinced or even predicting Corbyn will go in 2019 but, given the likelihood of Cable and May both leaving, 6/1 about the treble with Ladbrokes is worth a punt. Much stranger things have happened and events can move very fast.